Meet the Veterinarians & Team of Birch-Dan Animal Hospital in Scarborough. We’re pleased to provide exceptional vet care for your pets. Please call us at 416-266-1377 to speak to one of our caring veterinary team members. Dr. Harjinder Singh is a veterinarian and has been the owner of Birch-Dan Animal Hospital since 1990. 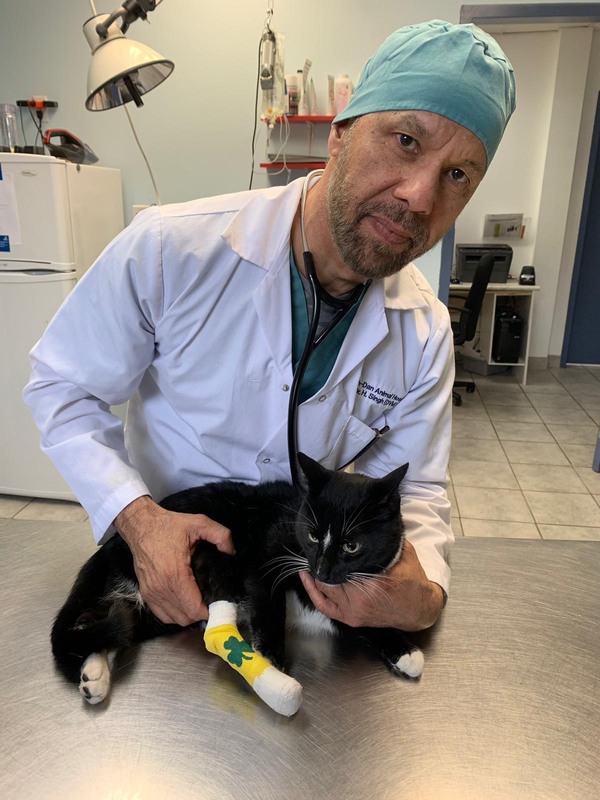 Now that he is a veterinarian, Dr. Singh says he gains great satisfaction from being able to work with our many clients and treat sick animals back to health after an illness or injury. One instance that comes to mind was a Collie that came into the clinic recently. It had actually inhaled a carrot and was not able to breathe. After conducting an emergency tracheotomy, Dr. Singh was able to clear the dog’s airway and save its life. For his undergraduate studies, Dr. Singh attended Punjab Agricultural University in Ludhiana where he earned a degree in Biology with a focus in Animal Science in 1981. During his time at University he was a member of the school’s field hockey team. In 1985, Dr. Singh entered Ontario Veterinary College where he earned his Doctorate of Veterinary Medicine in 1988. His area of special professional interest is surgery and he is a member of the Ontario Veterinary Medical Association. Cecille Kozminski is a Veterinary Technician and Receptionist who has been with Birch-Dan Animal Hospital since March of 2008. In addition to her years of experience, she is a graduate of the Medical Office Administrator Program at Everest College. At home, she has a Rottweiler named Chelsey, two rabbits named Thumper and Kiwi, aquatic fish Crush and Tiger and a patriot crab named Crabby. Karley Lux has been working in the veterinary field since her co-op placement in high school. She joined Birch-Dan Animal Hospital over a year ago. She helps our clients at the front desk as our Receptionist and helps the veterinarians and the patients in the hospital as the Veterinary Assistant. She enjoys the care she is able to give to our client’s pets and our clients and shares her life with her French bulldog, Winnie. Outside of work Karley works closely with the Redemption Paws Dog Rescue, and regularly opens her home to foster dogs from natural disaster areas. Kaiesha Robinson is a Veterinary Assistant at the Birch-Dan Animal Hospital. Kaiesha joined us in July of 2018. She has 5 years of experience working in the animal clinics and loves that no two days are the same. When she is not here helping our furry friends, Kaiesha enjoys reading, writing and spending time with her two dogs, Lexi and Mya! Brendan Fernandes is a graduate of Seneca College as a Registered Veterinary Technician. Since graduation, he has worked at several animal hospitals. He joined Birch-Dan Animal Hospital in the summer of 2018. He grew up grooming dogs and cats with his father where he decided to spend the rest of his life with our furry friends. In his free time, he enjoys being outdoors including camping, snowmobiling, and exploring the wilderness. Mike Brown is our General Assistant/Property Maintenance at Birch-Dan Animal Hospital. 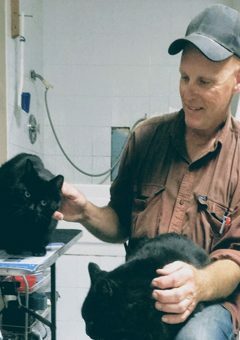 Mike joined Birch-Dan Animal Hospital many years ago, with his cats, Chester, Squeek and Smokey. Since his retirement, he has been helping us with the upkeep of Birch-Dan Animal Hospital, making sure everything is in working order, and our landscape looking crisp and beautiful. He is always there to lend a hand and give lots of TLC to our boarding pets. Erika Hardwick is a CO-OP student, who has a desire to become a vet one day. We think being in the trenches and observing is the perfect way to start. We hope Erika will have a very rewarding and enriching experience while getting plenty of opportunity to cuddle furry friends. Cidnee is the newest member to our team starting in november 2018. She is currently a veterianary assistant/receptionist with us and has been in the veterinary field since she graduated high school 3 years ago. She enjoys working out, reading, traveling, trying new things and of course always making new furry friends! She also loves spending time with her black cat Romeo that she rescued off of the streets 2 years ago. Cidnee hopes to one day become a pharmacist as she discovered her passion for medicine and helping others!